With US equities cooling from a morning high of sp'1949, the VIX rebounded from a morning low of 15.56, settling +11.1% @ 17.87 (intra high 18.43). Near term outlook is for 19/20, before renewed melt lower to the 15/14s by the FOMC of next Wednesday. With equities back on the slide, it was not surprising to see VIX break out of the big down trend from 31.06 - as best seen on the hourly chart. A short term bounce to the big 20 threshold looks viable, I'd be surprised if we break much above 21/22..... and that would need at least sp'1910/00. 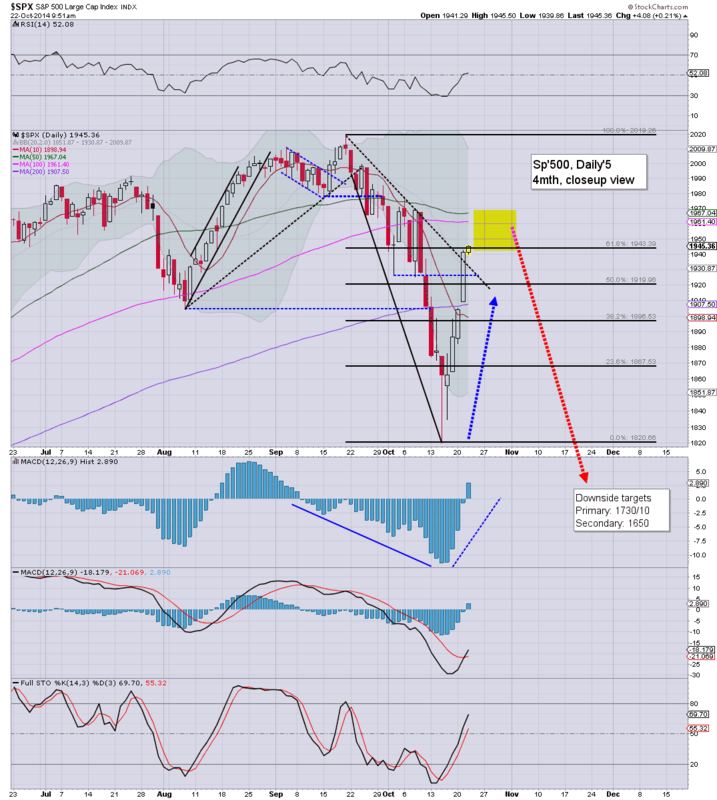 As things are.. best guess, sp'1950/60 with VIX 15/14s.... before a possible 'crashy' setup for November. US equities closed very weak, sp -14pts @ 1927, after a new cycle high of 1949. The two leaders - Trans/R2K, settled lower by a very significant -2.0% and -1.4% respectively. Near term outlook is for 1910/00 zone, before renewed upside to 1950/60s. A pretty interesting day, having broken a new cycle high of sp'1949, but with a rather strong swing of over 1%. There is a rather obvious gap to fill, and market should find support in the 1910/00 zone.. where the 200 dma is also lurking. Outlook is for broader upside into next week... we still look set for 1950/60s.. which would probably equate to VIX melting into the 15/14s. With the short term upward trend broken, equities look set for some weakness into the close. 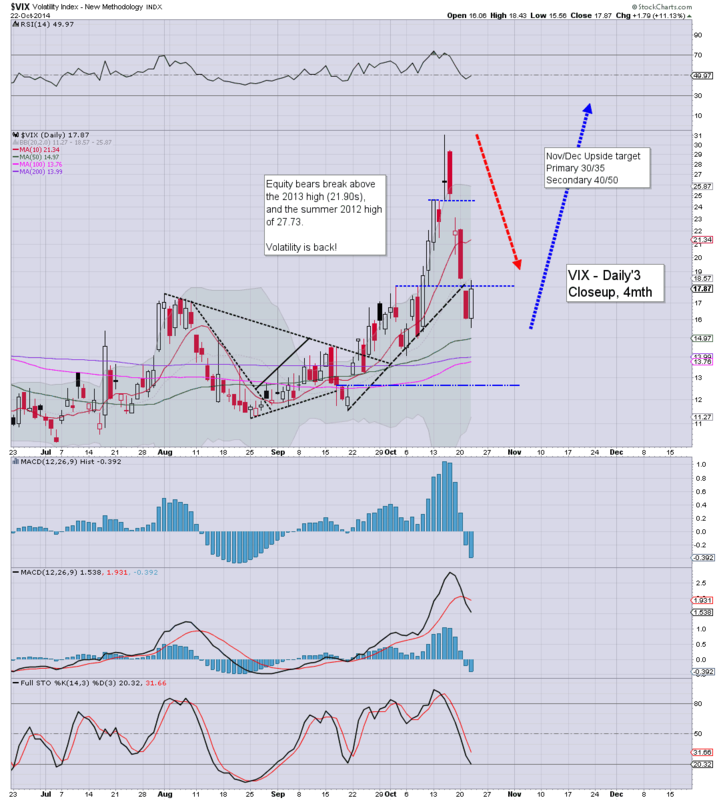 Best case for the bears, sp'1925/20, with VIX 19s. Primary downside for Thur/Friday, 1910/00 with VIX 19/20s... broader upside target... 1950/60s with VIX 15/14s. Interesting day.. and we have a short term top of sp'1949. A B, 2, or whatever you want to call it, down wave to 1910/00 looks very likely, completing either tomorrow or Friday. In either case, I still expect another wave higher to the 1950/60s next week. 3.15pm.. chop chop.. sp'1935.... a close <1930 looks ... probable. .with VIX 18s. Notable weakness, BTU -5%.. ugly... although not as bad as CREE -16.8% on poor earnings. As many note... Oil is very weak, -2.3%, and that is once again impacting the broader market. I'm still looking for 70/65..if main market rocked before year end. 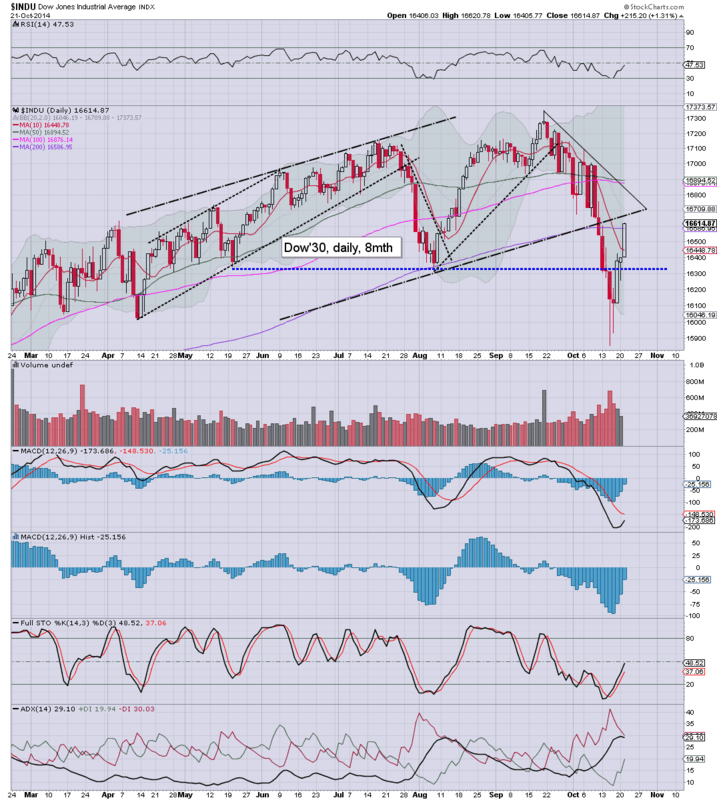 On no basis though does the market look set for sustained trading <1900 in the near term. First things first...lets get to the FOMC... next Wednesday. 3.50pm... A somewhat fun day.... sp'1926.. VIX 18s..... bodes for a weak Thursday..at least for part of the day. It is somewhat pleasing to see the bull maniacs get a little rattled. However, I do NOT expect a sustained move <1900 in this down wave. Broader target remains 1950/60s... by the FOMC of next Wednesday.. and then a potential crashy wave... but more on that later. Notable weakness, coal miners, BTU -4% in the $10s... looks set for eventually hitting $5. 2.32pm... chop chop.. in the low 1930s... a daily close in the 1925/20 zone looks probable, with VIX 18s. .. with follow through tomorrow. Mr Market is seeing a minor down cycle... with a somewhat obvious target of 1910/05 zone.. where the 200 dma is lurking. 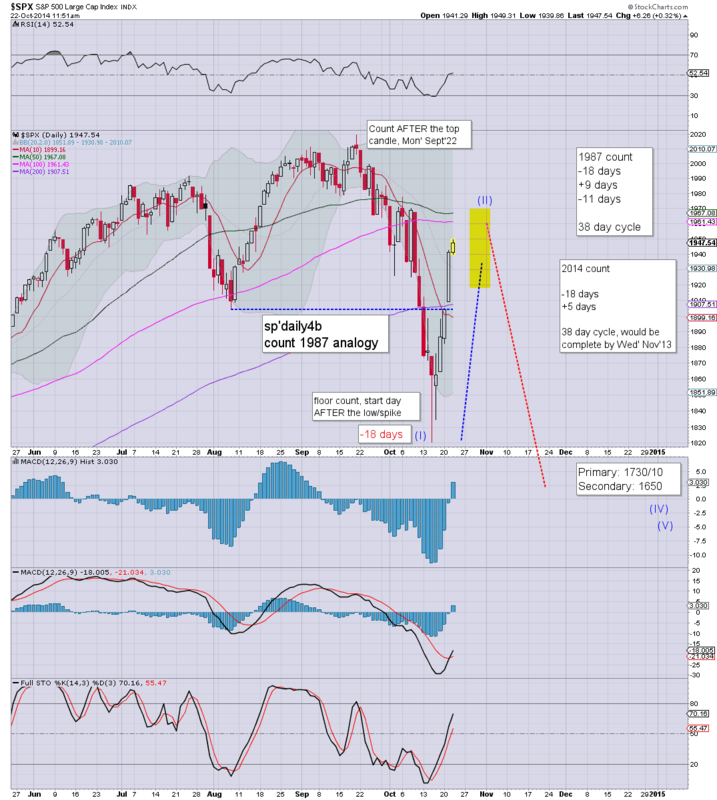 Broader upside to 1950/60s still looks due next week.. by the next FOMC.. when QE3 ends. Hourly MACD cycle will turn negative by the close of today... offering a daily close around 1915 or so. Since the failed break of Mon' Oct'6 - sp'1977, the sp' fell 157pts across 8 days, and has rebounded 129pts across 6 days. There is again increasing chatter of November 'problems' from people of quite different perspectives. *for those who like their analogies, it should be remembered that we saw a powerful green candle in late June 2011, before the market got stuck again.. putting in a critical lower high. Right now, I really want to see no higher than 1970. Today is day'5 UP, on any basis, I'm looking for 9 days, perhaps 14. Certainly, though, regardless of any minor weakness in the remainder of this week, there looks to be HIGH probability of sp'1960s. Next Wednesday's FOMC will surely announce the conclusion of QE3, which (surprisingly) didn't turn out to be so infinite after all. re: down cycle. Its just a 'moderate possibility'. On any basis, the hourly cycles are over stretched.. and its a rather obvious gap to fill. 11.21am.. its getting tiresome... sp'1948...a mere 1.1% away from 1970.. which for me, is where the bigger bearish outlook should get dropped. 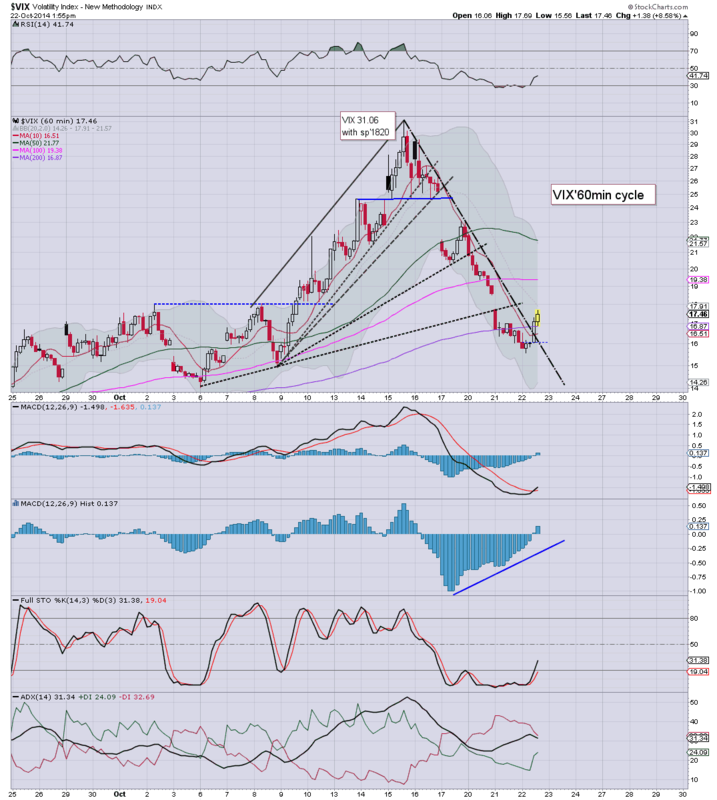 Notable weakness, Silver -2.2%.. who needs silver in the new world econmy, eh? Equities break new cycle highs, sp +4pts @ 1945. VIX remains very subdued, slipping fractionally lower into the 15s. 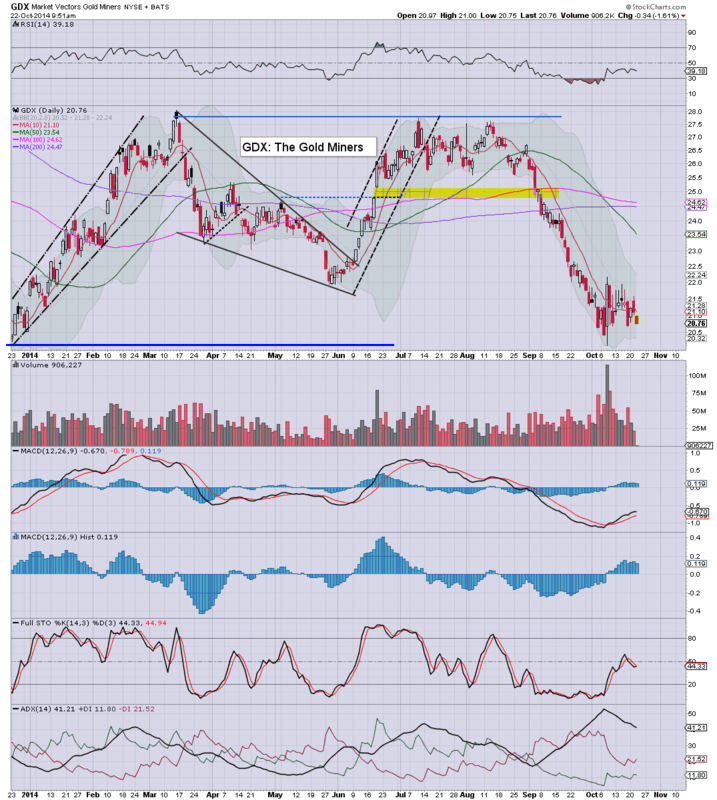 Metals are weak, Gold -$5, with Silver -1.7%.. that is not helping the miners, GDX -1.7%. Daily MACD (blue bar histogram) cycle on the indexes are turning positive, and there is a viable 3-5 days more to the upside.. which will take us into the next FOMC.. when QE3 is set to be concluded. So... sp'1950/60s look due...the only issue is do we get stuck there. The Cramer has indeed made for some truly bizarre viewing lately. A mere week ago he was effectively a doomer bear, but now.. its a 'everything is fine' mentality. Good morning. Futures are a touch higher, sp +1pt, we're set to open at 1942. Metals are a little lower, Gold -$5, whilst Oil is higher by 0.5%. Equities look set to claw higher - if much more slowly, another 1% across the next 3-5 trading days. *CPI: 0.1%, vs 0.0 expected. So... today will be day'5 of the up wave. I don't actually count until the first clear daily gain, even though Wed' closed hugely above the lows. Notable early mover, CHK +1.7% in the low $22s. As ever... make of that.. what you will. 8.45am . Precious metals look particularly weak, Gold -$5, but Silver -1.7%. No doubt, the gold bugs will be claiming all sorts of manipulation, but hey, they've been buying since spring 2011. Still need Gold $1000/900s.. before Mr Market has broken them. Naturally, miners are weak, GDX -0.6%, back in the 20s... teens look due. With a fourth day of equity gains, the bigger weekly cycles have clarified that last Wednesday's low of 1820 was at the very least, a short term floor. The ultimate question now is whether the current up wave is merely a crazy bounce, or the start of broader gains into early next year. So... the fourth red weekly candle has turned blue... and it does clarify that last Wednesday was at least a short term floor. Whether it is a key low for the rest of the year... that is the big issue now. For me, I'm drawing the line.. literally around sp'1970. There are a fair number of aspects of resistance in the 1960s, and if we start putting in any daily closes in the 1970s, then the bigger bearish outlooks should get dropped. I suppose the market could really try to annoy the most amount of traders with a brief break into the 1970/80s, only to swiftly reverse, but really, that would be so close to new historic highs, and arguably automatically rule out any hope of breaking <1820. The latest CPI is due, along with the EIA oil report. 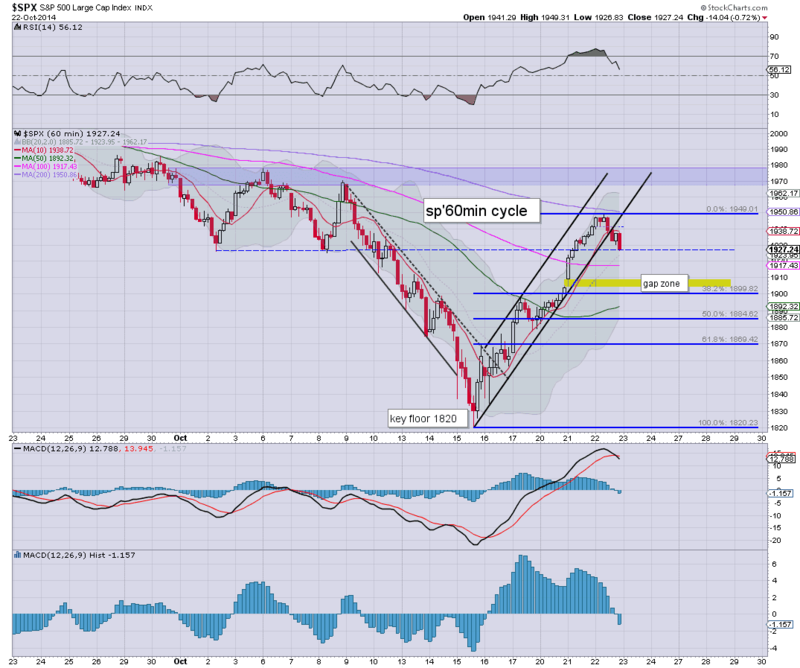 Interestingly, Oscar's short term target zone is my 'last line' of sp'1970. I'd have to say to Oscar... ANY failure to break and hold over 1970 keeps a deeply bearish November on the menu. A break back under sp'1900.. where there are old broken aspects of support - not least the 200dma.. would open up a swift crashy move to the sp'1650s. US equities closed higher for the fourth consecutive day, sp +37pts @ 1941. The two leaders - Trans/R2K, settled higher by 3.1% and 1.6% respectively. Near term outlook is for continued equity gains into the 1950/60s. Little to add. 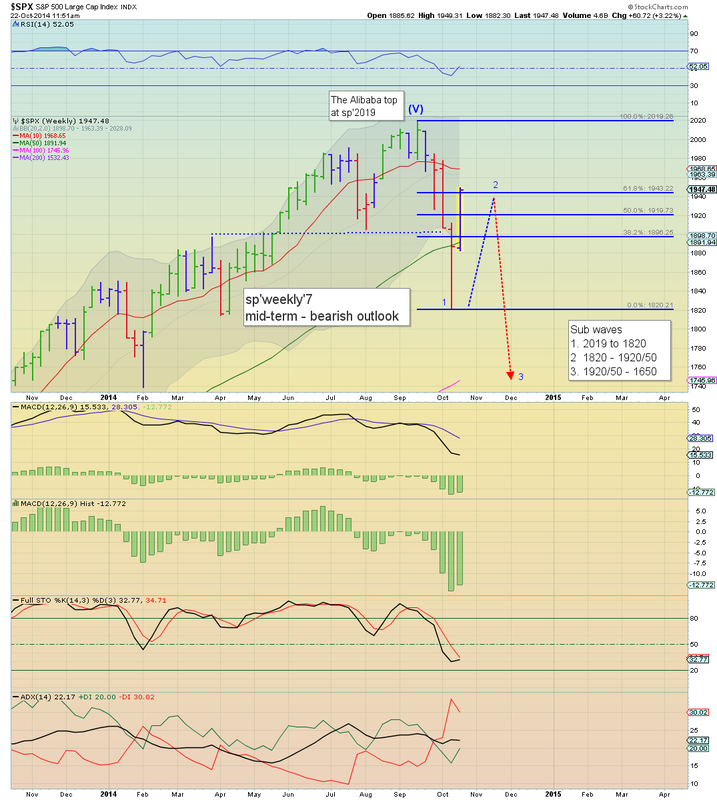 The bounce continues.... and if it goes much beyond 1970, it'll be white flag waving time for the equity bears.